We live in Belgium and we are building our own 4X4 traveling vehicle on a Mercedes Vario 814 4X4. Now we want to put single rim tyres on the back instead of the double wheels it has from the factory. But we are undecided for the tyre. We have the choice between the Michelin XDE2+ (285/70 R19.5 or 305/70 R19.5) and the Toyo M608 (285/70 R19.5). Can you as experienced travelers tell us which tyre you would prefer and why? The maximum weight of the vehicle will be 7.5 tons, but in general it will be between 6.5 and 7 tons. Personally I think the ground clearance and departure angle of their box, and the huge overhang make this 814 unsuitable for off-road use and I think it largely negates the benefit of having a 4x4 driveline. I have no experience of the Toyo tyre but I previously had the Michelin XDE2 on my two wheel drive mercedes 1823 truck (315/80 R22.5). Obviously on a 2wd vehicle the rear axle traction is important and I found the XDE2 useless in mud. The tread pattern may look similar to the off road block types but the tread depth is too small and the gaps between the blocks too narrow to effectively channel mud to the edge of the tyre. The XDE2 is designed as a multi-use city and highway tyre and I found it great for this job (until I got two flat spots from an emergency breaking manouvre!) but off-road it is not a good choice. The rubber is very hard which is good for long life but less good for getting traction on poor roads. The Michelin XZY/XDY is a much better tyre for a mixture of on and off-road travel and the tread depth is sufficient to make it much more robust on difficult surfaces. I would get the 305/70R19.5 if you can make it work with room and gearing. Your weight will always be more than you think and the 305 XZA in 18 ply rating has almost 500kg more load capacity than the 285 XDE+. It also has almost 6% bigger footprint which will make a difference on sand. Are you going to fit the same tires on front, I hope so in a 4X4! Will they fit at full lock? My Unimog "gained" 2.6 tons in the rear between pickup at Unicat with empty tanks and current state with full tanks and everything it carries. We will put the same tyres in front because it's a permanent 4X4. They should fit without any changes. Mercedes truck division is good at giving advice. It seems to make no difference if you purchase a new truck or a used truck out of warranty. Are you keeping the hydraulic feet? I agree about the limitation of that truck. I wonder what the weight distribution measures? All the heavy stuff must be right behind the cab. But it looks like an excellent price if the build is high quality. Just a tradeoff between rough road and living space. The hydraulic feet are mounted on the hilift chassis. So we will lose them. Also do they take to much place and limit the ground clearance in the back to much. Did you get them email I sent to your home address today from work regarding our experience with Toyo M608z Vs Michelin XDE2+? Do you have any information on where you intent to get your single rear wheels from? Yes I got it and I send you an answer. Thank you very much for your information. This is a firm not so far from where we are living and the owner also has the same vehicle type als we have, with toyo tyres. Thank you very much all for your information. With all the information I've got from the different forums and e-mails, we have decided to buy the toyo M608. 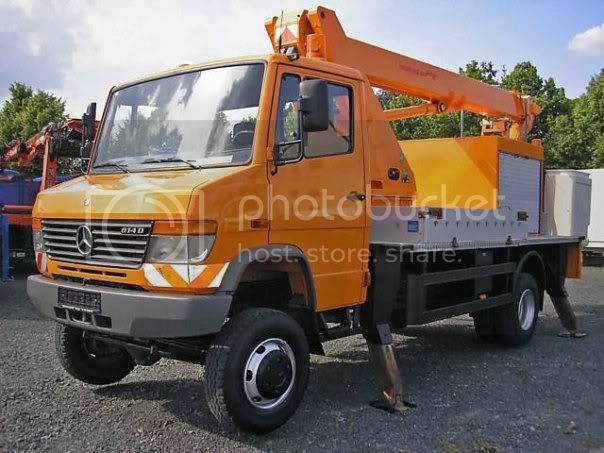 Hey, I am looking at converting a very similar vehicle to yours (814 4x4 ex-Utility Crane) any updates on your conversion? Hey motrjay, i'm just coming to the end of converting my 814d, not 4x4 (wish it was) but same otherwise. I'll post some progress pics up in a new thread when I get a chance if it helps. Did you end up sourcing and fitting single rear wheels? I'd be interested in where you ended up getting them and seeing a photo.